The MXR Distortion + pedal gives you magical classic distortion tones from a road-tough, pedalboard-friendly unit! The Distortion + bridges the realm between overdrive and over-the-top fuzz tones, making it an essential element of your tonal toolkit. It's amazingly easy to dial in your favorite tones; simply tweak the Distortion knob to get the amount of crunch you desire, and use the Output knob to get the volume level you want. Add tasty character to your amp tones or push out serious retro pedal crunch, with the Distortion + pedal! 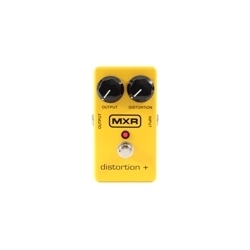 The MXR Distortion + pedal lets you take your guitar from tasteful crunch to tasty fuzz tones!